Lower Level Full – Unfinished basement with bulkhead. Built in 1982 3 bedroom upside down home in an established neighborhood in Tom Nevers. First floor: Three bedrooms one ..
See the stars from this extremely private property with main house and cottage on 1.3 acres with a view to ..
Tranquility in Tom Nevers! Private setting and only 2/10 of a mile to the beach. This lovingly maintained home is ..
‘It’s a Breeze ‘ is a delight for any upside down house enthusiast. Open living, dining and kitchen plan with ..
Great space and light with with open living kitchen and dining. Doors to the deck with views across conservation to .. 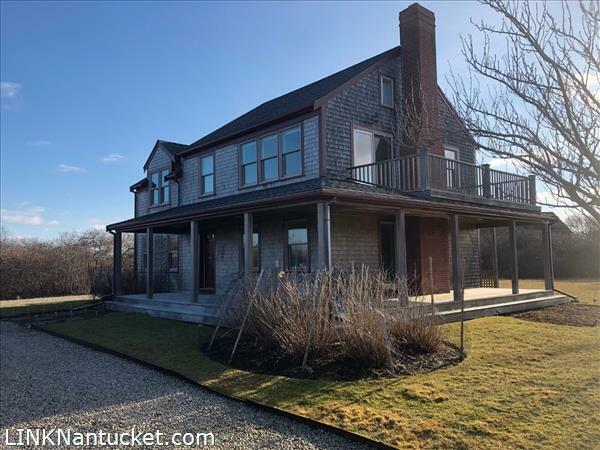 Exciting opportunity to enjoy breathtaking views of Tom Nevers Pond to Low beach and the Atlantic Ocean beyond from this ..
A perfect island escape. A renovated property in a peaceful setting on over 2 acres of land. The home offers ..
Beautiful multi building compound overlooking conservation land and ocean. 4 bedroom 4 bath main house. 2 half baths. 2 living ..
Lots of living space in this cozy well built home. First floor has open living room with fireplace, dining room, .. This waterfront property is quintessential Nantucket! Enjoy the sweeping views while your children are playing in the dunes or enjoying ..
Upside-down style Tom Nevers home situated on almost three acres of land with strong, sweeping ocean and conservation views and .. Whether you want to relax or entertain, this property has a beautifully manicured and private setting. Panoramic ocean views from .. Expertly positioned on 2.78 acres with room for a pool or expansion. This sun-filled home and cottage offer a total .. The 4 bedroom en suite home is in turn key condition and partially furnished; multiple decks offer distant ocean views; ..
Large Tom Nevers lot with mature vegetation and a welcoming beach house. Honey colored pine flooring, open living space and .. Enjoy sweeping pastoral and ocean views from this three-acre property in Tom Nevers. Ideal for those who seek the solace .. Located in a very private setting in Tom Nevers, this is a beautiful three-bedroom main house, and two-car garage with .. Waterfront Compound on 3 acres with sweeping water views of the Atlantic Ocean, private stairs to one of the most ..